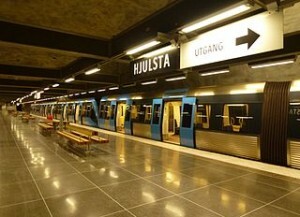 Public transport in Stockholm called Stockholms Lokaltrafik (SL) and consists of buses, subways, trams, commuter rail, and certain ferry lines. Subway Stockholm better known as Tunnelbanna, brushed T-Bana. With a hundred stations spread across the city, T-Bana can take us to almost all places in the city center to the suburbs. Stockholms LokaltrafiK ticket fare is divided into three zones, zone A, B, and C. not to worry, Stockholm city center and tourist attractions are still in the zone A. for the payment system we can choose to use coupons or travel card. Coupons can be used if we do not use a lot of transportation, while the daily card can be selected if mobility is high enough in one day. Coupons can be purchased in a single strip that contains 16 coupons for about 180SEK. Each trip within one zone requires 2 coupons, meaning a strip of coupons can be used for 8 times the price of any travel or trips around 22.5 SEK. We are free to use the coupon anytime we need and not bound by time. This is different to Stockholms LokaltrafiK daily travel card is valid, but does not limit how much and how often we use public transport. Stockholms LokaltrafiK travel cards are available for 24-hour pass to the price 100SEK or 72 hour pass with 200SEK price. Stockholm is great, but most of the tourist attractions congregate in one place and usually remained within normal walking distance. In fact, just jump over the bridge just been moved to a different island. That’s what makes me prefer to get around by foot. However, to achieve some public transport where it is needed, for example to Drottningholm Palace which is located outside the city center or to the island of Djurgarden Stockholm fairly far to walk from Gamla Stan. You can group several places to use public transportation into one day so that the Stockholms LokaltrafiK 24 Hour Pass you can settle for around town and went to all the tourist attractions. If you want practical, wear Stockholm Card only. With the card we do not need to be confused to think the cost of transportation and free admission to all tourist attractions. Neither coupons nor LokaltrafiK Stockholms travel card can be purchased at Stockholms LokaltrafiK Information Office is located in the T-Centralen Station near Sergels Torg or kiosk Pressbyran. Price does not include the travel card. So you need to pay the travel card about 120SEK for 24 hour pass. The card can be used again if we wanted to buy a travel card again. There are different views of when you will go to the bottom of Stockholm, precisely the time of entry into T-Bana Station. Carving art installations ranging from paintings, sculptures, reliefs to decorate T-Bana Station and each station has a different theme. There is a station that dominated Japanese bamboo from the garden and there is also a small ceramic decorated multicolored. All stations are skipped in the very unique way. Although the trip was boring because there is no view that can be seen, the station is laid out nicely makes the tuis are always curious about the theme that will emerge in the next station.